A newly-formed coalition in Santa Cruz is turning its attention to Lockheed Martin, which has a 4000 acre facility in Bonny Doon. Lockheed Martin (L-M) is the world's largest weapons contractor. It invents and develops high-tech war-fighting weapons, markets them to the Pentagon and to Congress, and sells them around the world on the open market. It pollutes the earth, both in the production of weapons and in their use in war. It has been convicted and fined for criminal violations of US law. And yet it has much more say about our government's policies than do ordinary citizens. Lockheed Martin buys access to our government representatives, largely with money it has made from selling weapons to our government, weapons that are both subsidized and paid for with our tax dollars. Profiteering from War. A newly-formed coalition in Santa Cruz is turning its attention to Lockheed Martin, which has a 4000 acre facility in Bonny Doon. Lockheed Martin (L-M) is the world's largest weapons contractor. It invents and develops high-tech war-fighting weapons, markets them to the Pentagon and to Congress, and sells them around the world on the open market. It pollutes the earth, both in the production of weapons and in their use in war. It has been convicted and fined for criminal violations of US law. And yet it has much more say about our government's policies than do ordinary citizens. Lockheed Martin buys access to our government representatives, largely with money it has made from selling weapons to our government, weapons that are both subsidized and paid for with our tax dollars. Just two months after September 11, the Pentagon contracted with Lockheed Martin for 3000 F-35 Joint Strike Fighter Planes, at the cost of 200 billion dollars. This contract has been touted as "the largest defense contract in history." In 2002, L-M received $19 billion in government contracts, including $2 for nuclear weapons. During the build-up before the war with Iraq, L-M boasted a 36% jump in profits, with a 15% increase in military aircraft sales alone. L-M is profiting from the war in Iraq, replenishing weapons for the Defense Department. For instance, L-M recently won contracts worth $109 million for kits that make dumb bombs "smart." L-M is the world's largest arms exporting company. It has sold more than 3000 F-16 combat aircraft around the world. The company also makes the Hellfire missile, "bunker buster" munitions and the massive C-130 transport plane. Developing Weapons of Mass Destruction L-M produces land mines, which kill indiscriminately. It produces weapons made with depleted uranium (DU), which contaminates the soil and the entire food chain. DU is linked to the "Persian Gulf Syndrome" which killed thousands of U.S. veterans, and thousands more Iraqis, after the first Gulf war. This corporation has an integral role in the US Space Command's plans to wage war in space. L-M produces laser weapons, satellite surveillance equipment, and many components of the Missile Defense ("Star Wars") system. Lockheed Martin is involved in creating a whole new generation of nuclear weapons, which will likely stimulate a renewed nuclear arms race. It is working on nuclear "bunker busters," which are being built not for nuclear deterrence, but as an option for actual use in the War on Terror. In spite of the fall of the Soviet Union, Lockheed Martin carries on with the nation's only Intercontinental Ballistic Missile program. It builds Trident II nuclear missiles, for use on Trident II Submarines. Components of Trident missiles are being built in Bonny Doon. There is a Trident II facility on Lockheed Martin in Bonny Doon. When Santa Cruz citizens campaigned against the Trident II program in the early 1980s, the government established a naval base on the grounds of Lockheed Martin in Bonny Doon, and moved the Trident II program onto the naval base. The Bonny Doon Trident II program has been shrouded in secrecy that continues to this day. Why did Santa Cruzans oppose the program? The Trident II (D5) is a 3-stage missile with a range of 4000 miles. Each Trident II missile carries eight independently-targeted 475 kiloton thermonuclear warheads. Each Trident sub carries 24 of these missiles (192 warheads). Eighteen Trident submarines roam the world's oceans, each with the firepower to destroy an entire continent with nuclear weapons. 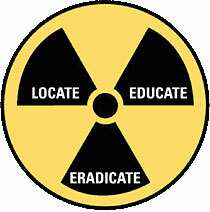 Past and current anti-nuclear activists in Santa Cruz say, "Not in my backyard. Not in anybody's backyard." The Trident II program threatens all life on earth. It must be shut down. Twenty-eight former L-M executives are members of the Bush administration. Lynne Cheney, the wife of the Vice President, is a former member of L-M's Board. Lockheed Martin is headquartered in Bethesda, Maryland, but because it has facilities in all 50 states, it has a "big political footprint." L-M curries favor by contributing to political campaigns at every level. It gave more than $2.2 million in political donations in 2002. Though weapons-industry PACs like L-M favor Republicans to Democrats by a 2 to 1 margin in contributions, they give to both in order to ensure access and influence. Lockheed Martin pays lobbyists to convince the Pentagon that it needs the weapons it has designed, and to persuade members of Congress to approve lucrative weapons contracts that will please voters by bringing jobs to their districts. But L-M does not limit its lobbying efforts to marketing weapons of mass destruction. It also puts its lobbyists to work trying to influence our country's military, foreign, and even domestic policies. L-M played a role in developing support for the war in Iraq. Former Lockheed Martin vice-president Bruce Jackson chairs the Coalition for the Liberation of Iraq, which was formed in 2002 promote Bush's plan for war in Iraq. L-M produces many of the weapons used in Afghanistan and Iraq. L-M has been convicted of numerous crimes. For instance, in the 1970s, Lockheed Corporation (now L-M) admitted to paying $22 million in bribes to win overseas contracts. In 2001, LM paid a $4.25 million settlement agreement to the US for allegedly using Foreign Military Sales funds illegally in a contract to modify sonar systems used by Egypt. Lockheed Martin is not a good neighbor. An Environmental Hazard in Bonny Doon? Many L-M facilities around the country have been contaminated. Since L-M has been testing and developing weapons in Bonny Doon since 1957, it is reasonable to ask what kind of environmental controls are in place. What chemicals are being released into our environment? What materials are being shipped through our county? What emergency response plans are in place in case of an accident or a hazardous spill? So far, our research indicates that such information, plans, and controls are inadequate. Our position is that the public's right to know what hazards they face should supercede L-M's (and the government's) right to secrecy. We request this information from L-M and from our government representatives. We're (Los Alamos Study Group - www.lasg.org ) organizing a citizens' inspection of another Lockheed Martin facility on August 4th in Albuquerque, New Mexico. Sandia National Labs, a nuclear weapons design and engineering plant with an annual budget of more than $2 billion is one of the largest weapons of mass destruction facilities on earth. On August 5th the Study Group is conducting a citizens' inspection of the Los Alamos National Laboratory (managed by the University of California) one of the two main sites for U.S. nuclear warhead research, design, and production. Hope the inspection in Santa Cruz go well!